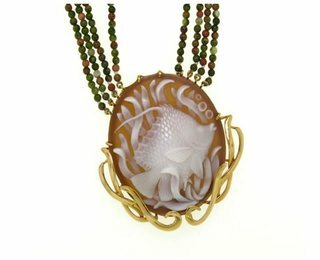 Angelfish w/grass cameo necklace, comprised of a 40mm hand carved shell cameo, is set in 18kt recycled yellow gold with crazy lace green agate beads. The use of green agate beads is intended to give the feeling underwater sea grasses, that move as the wearer moves. A unique, Wounaan artist signed original, eco-friendly, Fair Trade. 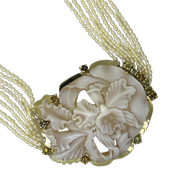 From the Marinelife collection. Registry # 798. Sold with a Certificate of Authenticity. As seen in Tatler Magazine, March 2016 edition and Condé Nast Traveller UK magazine, June 2016.